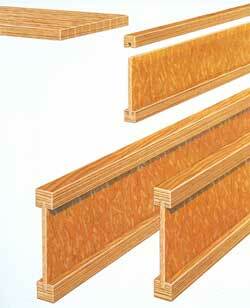 Prefabricated wood I-joists are used throughout the world and are well accepted by the construction industry. Prefabricated wood I-joists are high-strength, cost-effective, and versatile building elements for floor, roof wall framing in residential and commercial construction. Product lines are manufactured in many sizes, using a number of component materials to obtain a wide variety of engineering design properties. 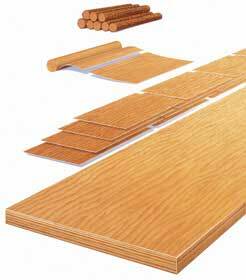 Prefabricated wood I-joists are specialized products, manufactured with specially designed equipment. Expertise in adhesives, wood products, manufacturing, and quality assurance are necessary for the fabrication of high-quality prefabricated wood I-joists. Prefabricated wood I-joists utilize the geometry of the I-shaped cross-section and high-strength components to maximize the strength and stiffness of the wood fiber. Flanges are manufactured from sawn lumber or structural composite lumber, whereas webs typically consist of plywood or oriented strand board. The design of the prefabricated wood I-joist efficiently utilizes and optimizes the wood fibers. The flanges (the top and bottom of the assembled member) are designed to resist bending forces and to add stiffness to the product. The web section is designed to withstand the shear forces in the joist. Adhesive applied in the rout of each flange creates a durable exterior structural joint. An I-shaped cross-section, as opposed to a solid rectangular cross-section, requires additional considerations. Due to its particular shape, the prefabricated wood I-joist requires special examination for and interior reaction capacity, shear capacity, deflection, connector compatibility, vertical load transfer at points of bearings, web holes, and floor and roof performance. The unique manufacturing techniques and the variety of materials that are utilized result in design values that are typically proprietary to each manufacturer. Prefabricated wood I-joists are tested and qualified under ASTM Standard D-5055 and are recognized in evaluation reports issued by one or more of the model building code evaluation service organizations. While the growth of engineered wood products (EWP’s) have been significant during the past 25 years, they are targeted for an even greater growth rate in the coming decade. As the industry grows and matures, technical information of assistance to new manufacturers, builders, designers, and code officials will become even more critical. WIJMA has formed a unique group of technical individuals who work together on common issues that impact their own business as well as the industry. The Association’s proactive membership in industry activities, construction practices, and manufacturing issues has led to numerous projects and activities aimed at enhancing and increasing the use of EWP in the residential and commercial construction industry.